Don’t think that a big new truck stop is the only thing going on in Millersburg. I found out otherwise when I wondered this week whether the city on Albany’s north side had yet issued a building permit for Love’s Travel Center and Country Store, which got the go-ahead last month. City Manager Steven Hasson disabused me of the notion that the truck stop was the only bit of news in this fast-growing town. For one thing, he told me, the Millersburg Planning Commission on March 21 had approved a conditional use permit and site plan requested by Ti Squared Industries of Sweet Home, which intends to build a 40,000-square foot plant to make titanium castings. The plant will be on Western Way, a dead-end street east of Old Salem Road that already houses half a dozen other industries. The company expects to start with 30 employees and, if business warrants, may expand to about 100 in five years, the planning commission was told. The new titanium foundry will go in this area. I-5 is in the background. Construction would likely start in June and take a year, according to the application. The property backs up to Interstate 5. Any emissions of steam and dust would be within environmental standards, and there would be minimal noise and no odors. Traffic would be mainly the coming and going of employees, plus perhaps three trips a day for shipping and receiving. Eventually, the plant may add a “chemical milling operation,” which was described as a fully enclosed system in compliance with environmental rules. 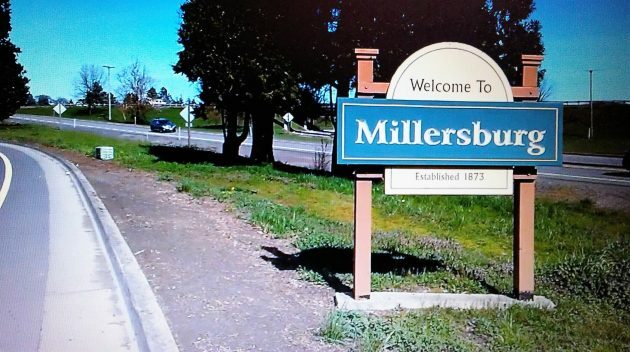 Like the rest of the mid-valley, Millersburg was hit hard by the closure of International Paper’s Albany mill in December 2009. But the town has kept growing anyway, from 1,375 people five years ago to 1,730 in 2016, according to the official estimate the state uses to allocate shared tax receipts. 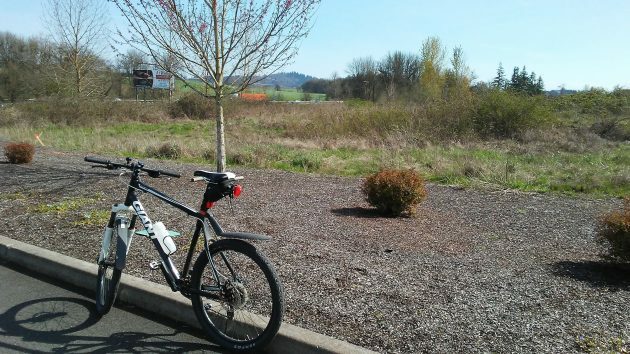 The residential growth has resulted in many new subdivisions with wide streets and very little daytime traffic — a great place for leisurely bike riding on a sunny day like Friday. And the growth continues. And as for the truck stop on Old Salem Road, Hasson reports, Love’s recently sought and received a lot line adjustment and submitted its development plans to Millersburg’s engineer, who marked them up and sent them back for changes. 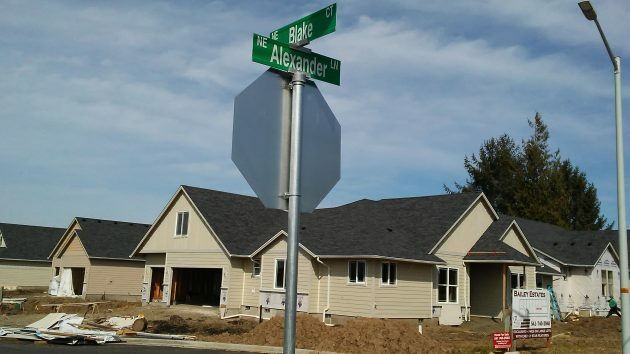 Houses under construction in Millersburg as they looked on Friday.